Several prepared meals are displayed with wine inside the Delta Airlines Gate Gourmet facility at the Cincinnati Northern Kentucky International Airport, Tuesday, April 22, 2008 in Erlanger, Ky.
Washington’s Supreme Court will decide whether employers must accommodate the religious practices of their employees. Justices heard oral arguments Tuesday in a lawsuit that involves four men who makes meals for airline passengers. Because they are not allowed to bring their own food to work, their employer, Gate Gourmet, provides them lunch. The men allege the meal choices did not accommodate their religious dietary restrictions. Attorney Aaron Rocke, who represents the four men who brought the suit, told the high court that Washington’s anti-discrimination law should obligate employers to make reasonable religious accommodations. 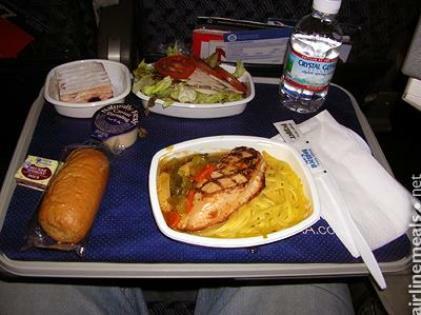 In this case, Rocke said, Gate Gourmet was already making meals to accommodate airline passengers. “They make halal, vegetarian, gluten-free meals, they respect the dietary preferences of airline passengers in a way they don’t afford to their own employees,” Rocke said. The attorney for Gate Gourmet countered that Washington’s anti-discrimination, as it is currently written, does not require employers to make religious accommodations. “I do not wish to belittle the problem; I understand it, but I don’t think it amounts to a battery under Washington law,” said attorney Shane Sagheb. Sagheb noted the employees had not suffered harm such as being fired or demoted because of their beliefs. The workers’ attorney countered that under Washington’s anti-discrimination law, employers should be required to make reasonable accommodations for their employees’ religious needs. The employees at Gate Gourmet are mostly immigrants from Ethiopia, India and Pakistan. They’re Hindus, Muslims and Orthodox Christians. Because of their religious beliefs, many don’t eat pork or beef or are strict vegetarians. And that’s where the conflict with the company comes in. Gate Gourmet provides workers with what it calls a “healthful meal” each day. And Seth Rosenberg, the attorney for the workers who are suing, says when people complained that the meat being served in the spaghetti sauce was pork, the company did initially switch to turkey and label it as such. “Apparently GM did—switched it back to pork without telling anybody," Rosenberg said, meaning people were unwittingly eating something they were religiously opposed to. And, Rosenberg says, that isn’t all. He says Gate Gourmet has continually refused to adequately label the meat served or provide vegetarian options. Even the refried beans, he says, are cooked in animal fat. The irony, Rosenberg says, is the kind of work the Gate Gourmet employees are doing at the Sea-Tac facility. “They’re preparing meals, specialty meals for the airlines, including kosher meals and other meals involving dietary restrictions,” Rosenberg said. Attorneys for the workers argue that religious protection is an implied civil right in Washington, that the state has always been in the mainstream in respecting religion and that ruling otherwise would brand the state as a fringe haven for religious intolerance. Even if Gate Gourmet employees lose in the state Supreme Court, they still have the option of filing a civil rights case under federal law, which does specifically ban religious discrimination. Workers near Sea-Tac Airport, who prepare the meals served on many airlines, say their employer is failing to accommodate their religiously-based dietary needs. Gate Gourmet provides meals for employees who are not allowed for security reasons to bring their own food into the facility or to eat lunch off-site.